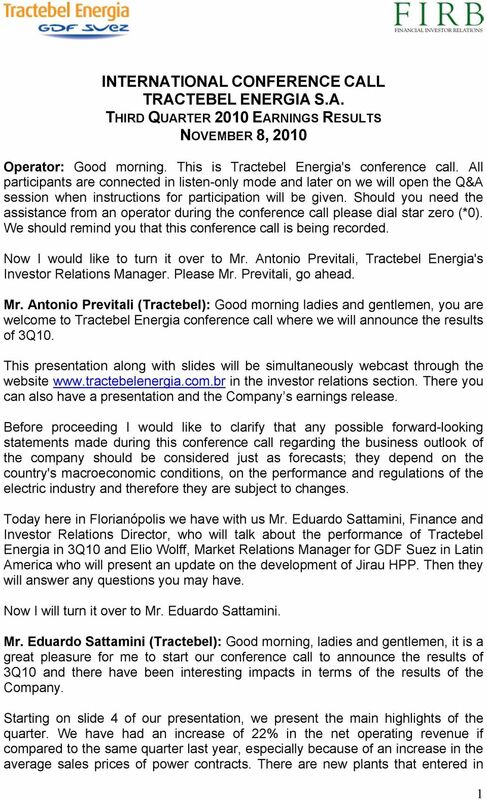 Download "INTERNATIONAL CONFERENCE CALL TRACTEBEL ENERGIA S.A. THIRD QUARTER 2010 EARNINGS RESULTS NOVEMBER 8, 2010"
BANCO ITAÚ HOLDING FINANCEIRA S.A. International Conference Call RESULTS OF THE 1 ST QUARTER OF 2003 May 7 th, 2003 11:00 a.m. Operator: Ladies and gentlemen, thank you for standing by. At this time all lines are in a listen-only mode. Later there will be a question and answer session. Instructions will be given at that time. During 2013, we had special advances in the main civil works, and the execution of the social and environmental commitments related to the license. 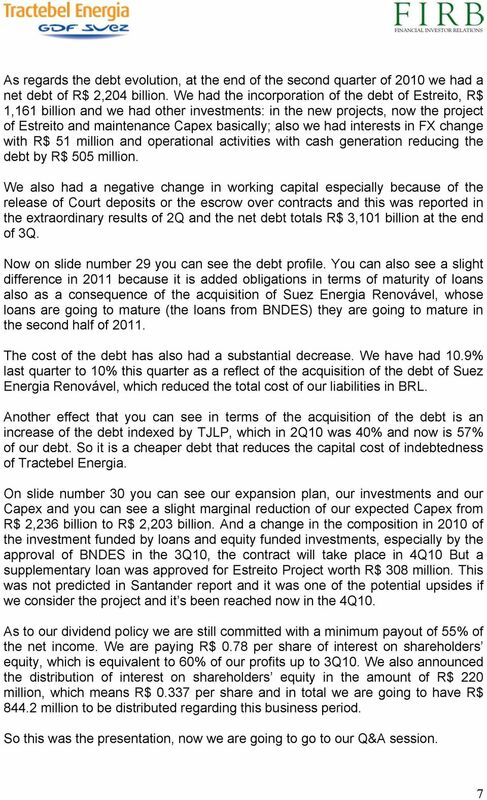 RICHARD: Welcome to the third quarter 2013 Endesa Colombia results conference call. My name is Richard and I will be your operator for today s call. At this time all participants are in a listen-only mode. 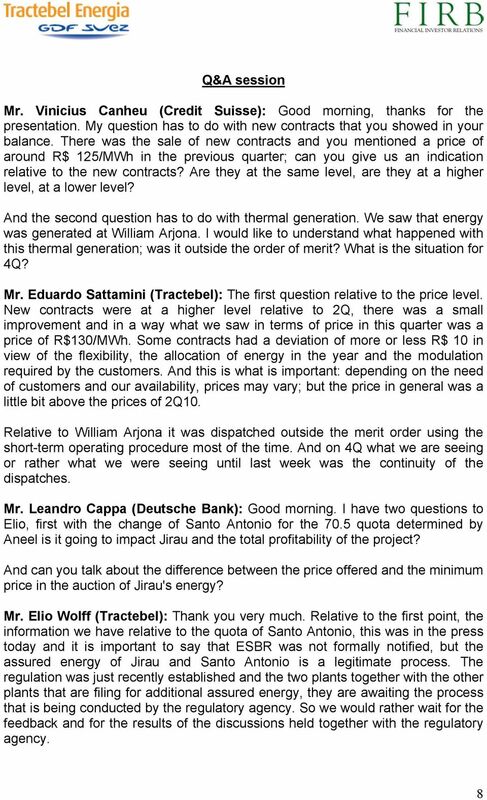 February 24, 2011 Transcript Audio Conference Call in English 4th Quarter 2010 Results WEG S.A.
Good morning. 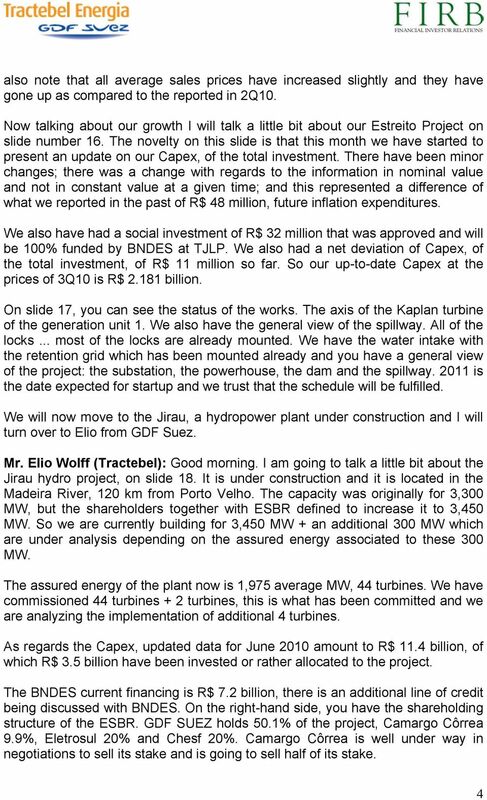 I will read you a brief message from our CEO, José Isaac Peres, to you. So, now I would like to pass the floor to Mr. Carlos Medeiros. Mr. Carlos, you have the floor. Good morning, this is Jose Velez, CEO of Cementos Argos. I am joined by Mr. Ricardo Sierra, CFO and Maria Clara Aristizabal, Assistant to the CEO. Now, I turn the conference to Mr. Adalberto Pereira dos Santos, CFO and IRO, who will start the presentation. Mr. Santos, you may proceed. Now, I will turn the conference over to Mr. Henrique Cordeiro Guerra, who will start the presentation. Mr. Henrique, you may begin the conference. 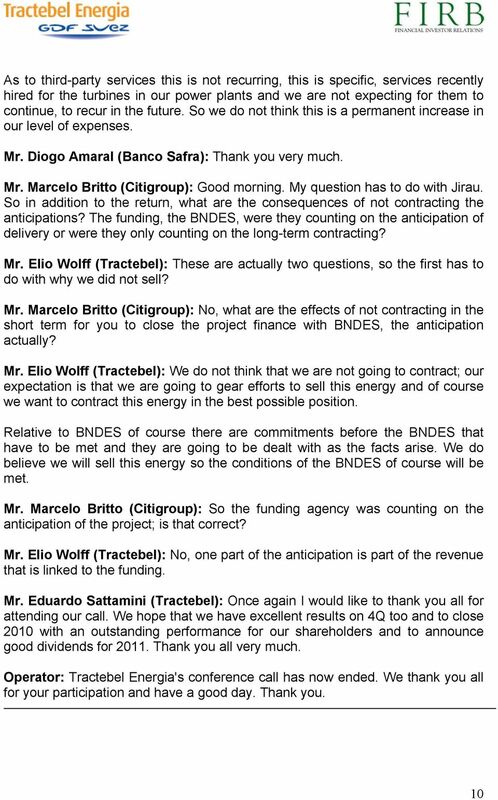 Now, I will turn the conference over to the CEO, Mr. Carbonari, who will begin the presentation. Mr. Carbonari, you may begin your conference. Now I will turn the conference over to the Company. You may begin your conference. 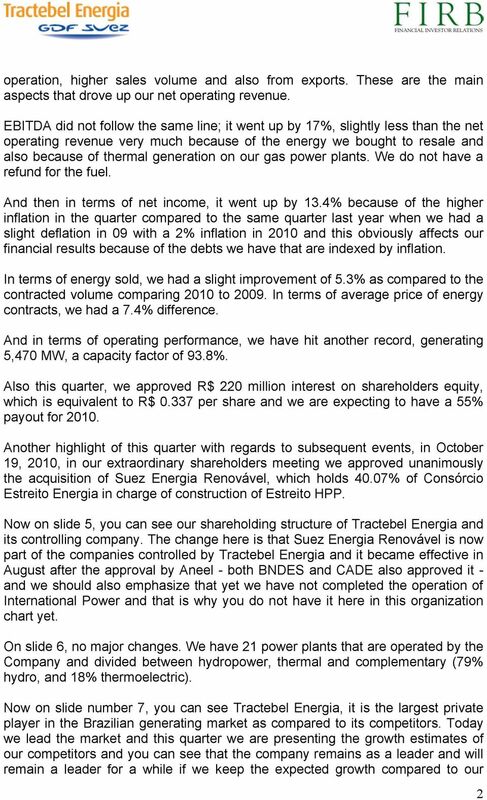 Transcript Financial Result of the 4th Quarter 2002 Conference Call Net Serviços de Comunicação S.A.
TGI & Cálidda Results 1H 2015 Grupo Energía de Bogotá Call Conference Earnings Conference Call TGI and Cálidda: Results and Key Developments 2Q2015 Operator Instructions Good morning ladies and gentlemen. 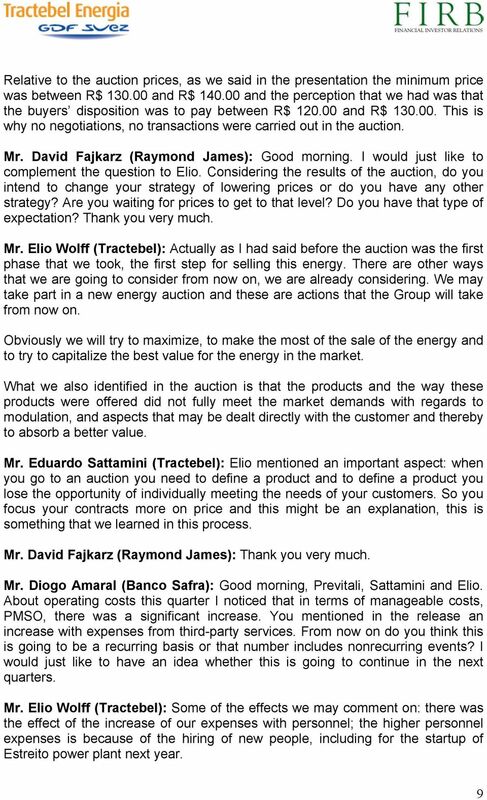 Conference call Transcript Release of 2012 Audited Consolidated Results Good morning America and good afternoon Europe, Welcome to Hrvatska elektroprivreda d.d. s first investor relations conference call. Now I will turn the conference to Mr. Paulo Pinto, who will begin the conference. Sir, you may proceed. Mr. Paulo Pinto, you may proceed. Operator: Good afternoon. 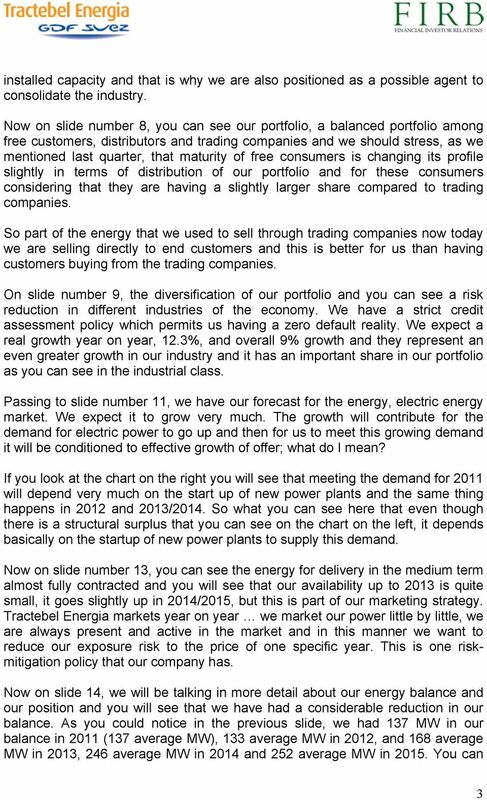 Welcome to Light's 4Q14 Earnings Conference Call. 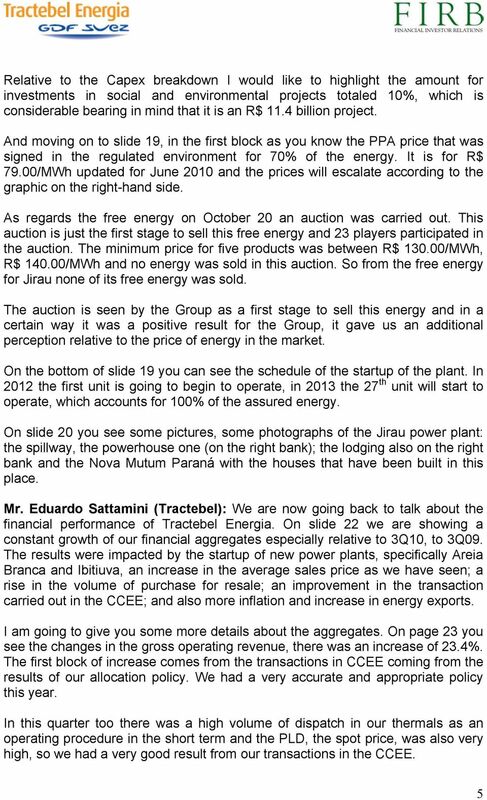 Today we have with us Mr. Paulo Roberto Ribeiro Pinto, CEO and Mr. Joao Batista Zolini Carneiro, CFO and Investor Relations Officer. 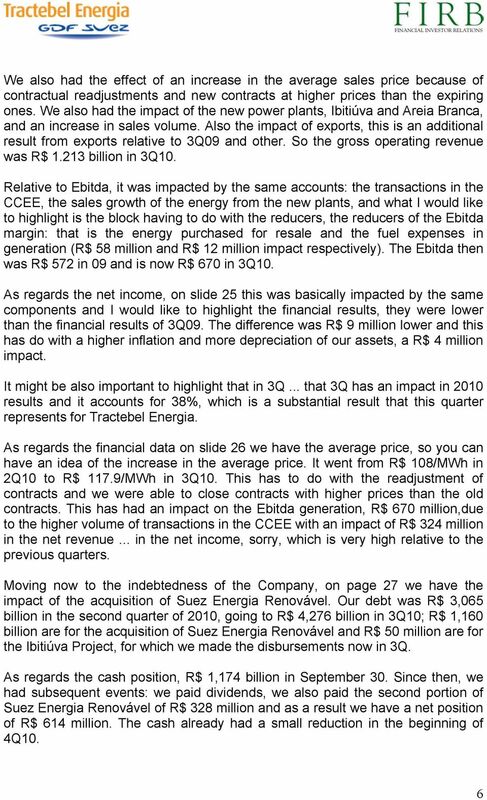 Second Quarter 2015 Earnings Conference Call NYSE: CVA JULY 22, 2015 Cautionary Statements All information included in this earnings presentation is based on continuing operations, unless otherwise noted. 1. Debt securities are instruments representing a creditor relationship with an enterprise.